Mustachian Post - 9 concrete action points from the book "Essentialism: The Disciplined Pursuit of Less"
Since I stopped to read novels when I was about fifteen years old, I was considering myself as a "bad" reader as I had to force myself to finish a book during several weeks/months. You know the feeling: you've found this interesting book that you committed to read. Or you even added it to your job yearly goals list. And then you wait until the last quarter (ergh, week) of the year to read it, as when you were preparing for your exams at the last minute at University... You eventually get to finish it during Christmas holidays, after weeks or even months of fighting with yourself to stay focused. See what I mean? Remind you some memories? Then I have a good news for you! You're not a bad reader! You were simply not reading the right books for you!!! At least that's what I discovered for myself when I read "Essentialism: The Disciplined Pursuit of Less". I never waited that much for my commute back home. Usually I would be tired after an intense workday and opening a book would be the last thing I would think of. Nothing like that with this Essentialist book: I was motivated to read as I never was, from the beginning to the very last page! 1/ The topic of the book truly interested me and was close to my heart. I didn't chose to read it because I had to (for work for instance). This can sounds obvious but I did read (too) many times for somebody else other than my true self. 2/ The author is very good at telling stories based on real life facts and not on some boring theories. 3/ I naturally created concrete action points without thinking about it. This all along the chapters! This diagram is the one that best summarizes the book. Before starting this article I've googled the title "Essentialism: the Disciplined Pursuit of Less" and found many book reviews/summaries about it so I decided I wouldn't write one more. Instead I will list you what are the concrete actions I took right after (or even before) I finished to read this book. This one is I think the most life changing effect I put in place straight away. As you probably are an investor if you read this blog, imagine that you would throw the best asset you have - i.e. your money - to buy fancy things such as a brand new Audi RS5 on a leasing contract. Don't you think this would be stupid regarding your bigger goal which is to become financially independent? But you must understand as young as possible that the best asset of your life - hence of all the projects you undertake - is first and foremost your health. And as you're doing it great with your money, you must do the same with your sleep to protect the most important asset of your life! Because without health there is no time, hence no money, no investement, nothing. So whatever you do think is very important, take care of always sleeping enough. You'll be a better yourself. And you will achieve a lot more!!! Which in return will produce more, and get you even more money back than if you didn't sleep correctly. Because without health there is no time, hence no money, no investment, nothing. 2/ Create space in your schedule to step back, breath, read and explore. In our world of opportunities and information overflow, we (at least I) tend to always have something on our todo list no matter what we manage to achieve. If you are lucky to be organized and have read Getting Things Done, I'm sure you once managed to have some free time on Friday prepare your next week while realizing it would be a calm week counting how many remaining todo items you've got. And then baaam! In the middle of your planning, you receive this super important mail that can't wait (at least you think it can't) and which piles up ten more todo items on top of your for-once-almost-empty-todo-list... Sounds familiar? This issue is very often a symptom of over-achievers and I-can-do-it-all people. You end up feeling busy all day long, but without achieving anything... Or not something that you can remember of. As with any job task/meeting, time to step back, breath, read and explore needs to be scheduled! That's why I now book one full day every one or two months which is dedicated to reading books, exploring stuff that I never have the time to check and most importantly, to step back from my daily business and think about the global picture and where I wanna go! No phonecall, no email, no external disturbance! I planned to do that from home when wife is at work and children at school. In the book, the author gives the example of Bill Gates which has two "Think Week" per year. I will see if my format is good enough, else I will consider the former Microsoft CEO's solution. 3/ If during a potential employee interview, my gut feeling is lower than 90%, then it is a clear no. This is another concept described in the book that explains that you will always find good opportunities, but seldom they will be essentials! As I'm involved in the hiring process at my company, I decided to first apply this 90% rule to the people we interview. Hiring is such an important thing - as you never want to be bothered with an average employee, or even worse, with people that you wish you have never hired - that from now on it's clear: gut feeling < 90% equals a strict no. No matter the experience or the seven PhD the guy has, it's a big YES or a strict no! The same can apply to the choice of your ETFs or to your high dividend stocks. 4/ I dropped a side mobile app that was bringing in CHF 100/year. Before reading the "Essentialism" book, I was still thinking that this was cool to have something on the AppStore to brag about, that the app was paying my Apple Developer yearly fees, and that I would update it at some point with new features that would for sure definitely bring in way more money. That's why I decided to let my Apple Developer account expires in a few days, and the app to die by being removed automatically. I already see the benefit of not having to think about it anymore. Not having to regret the fame and money I could have got with it as it's not longer existing. Now I have more space and freedom to focus on what matters! 5/ I stopped two other online side projects. The second large opportunities that I cut were two private website projects. Same as some clutter in your wardrobe, they weren't bringing that much value but I spent so much time on them at some point that it was hard to let them go. But the verdict is the same as point 4. Not essential? Drop it! And God I feel better now! Declutter man, declutter!!! 6/ I dropped a huge amount of neglectible todos. Do you have todo lists somewhere? On Post-its or in a software like Things? So read this book first, then go through your todo list: you will never have seen it like this before! I cut my todos (I would say I had about 50-100 items) by at least two third just after I finished the book. You can't believe how much free space in my mind I got by simply decluttering items I thought I would work on someday (read "never"). The problem with self assignements is that the wrong ones rapidly become broken agreements with yourself. I talk about these polluting ones that remain in the list after months. 2/ Take time to go through each one - like plan 1 or 2h when you do that. Don't make the mistake to only skim through with the risk to think "Yeah let's move this one to next week when I'll have more time to think about it." - we all know you (neither I) won't! 3/ For each todo, ask yourself "Will I lose an essential outcome if I don't do this item?" and if your answer isn't a clear "YES", then drop it. That's all! 7/ I clearly decided that my main side project focus of the moment is this very MP blog. And Financial Independence at a higher level. As many entrepreneur's minded people, I have a new project idea every now and then. Now, I learnt that one entrepreneur best skills to develop is to focus. Thanks to this book, I stepped back to ask myself the following question: "If I would do something for free, what woud it be?" I figured out that writing about my journey towards financial independence was THE thing! The one that I'm doing for free and that I would continue to do for free no matter what. So be reassured, this blog shouldn't die in the next months! 8/ I created routines to write and read every single workday. Greg explains that routines can have a dramatic impact on your life - either positively or negatively. Example of a very bad one is the habit some people have to smoke just after a good lunch, or right after waking up. On the other hand, a very good habit can be to read a foreign newspaper every morning during the breakfast in order to learn another language. Routines can have a dramatic impact on your life - either positively or negatively. On my side, I decided to make routine work for me during every morning and evening commutes. Concretely, it is defined that my morning commutes are now reserved for writing about personal finance stuff on this blog. This way, it helps me to stay focused on what's important. After some weeks, I don't have to think about it anymore. I jump on the train, find a seat, open ByWord on my iPhone, and start or continue to write an article! For the evening commutes, they are dedicated to reading so that I always have about 2h a week to learn new things. 9/ I declined a meeting with a financial company CEO as I was away for holidays with my family. This is exactly for these kind of decisions one has to make that this book was written. I did step back up to the scale of my life (and not only the following days/months) and I asked myself: "Some invaluable free time with your wife and children VS. two hours with strangers that won't change my life for sure." What would have been a tough decision otherwise became such a clear and easy task in the end thanks to this book: I liaised with my colleague on Slack and informed them they would have to make it without me this time. Did I regret it? Not even one second! When the C-level meeting occured, I was actually at an amazing Italian restaurant with my children, wife and wife's parents. This was essential! Not this one other meeting! How does this book relate with personal finance? Financial Independence? Well, I see at least two concrete relations between "Being an Essentialist" and "Becoming Financially Free". The first relation is that by following the Essentialism path, you will start living by design and not by default anymore. You will choose your life and what you make out of it. Everything you will undertake will come from your true self, hence you will multiply the otherwise so-so outcomes by hundreds! And as everyone know, once you start doing something which is important to you, there are many - financial or not - benefits that come as consequences. That way, I see Essentialism as a very good support towards your Financial Independence goal: doing what you love while building your stash! The second link I see between Essentialism and Financial Independence is that it will help you solve the post-FI-journey question: "What should I do now?!?". It's awesome to stash cash as you surely experienced it, but what are you gonna do once you will have reached your FI amount? Sit down on a beach and get fat at light speed by doing nothing meaningfull of your days? No thanks, not for us! That's when the Essentialism way of life will come to your rescue as you will ask yourself what the hell you would like to do with your life now that you don't have to work for money anymore. My advice: read it way before this D-day and don't waste your precious life until then. 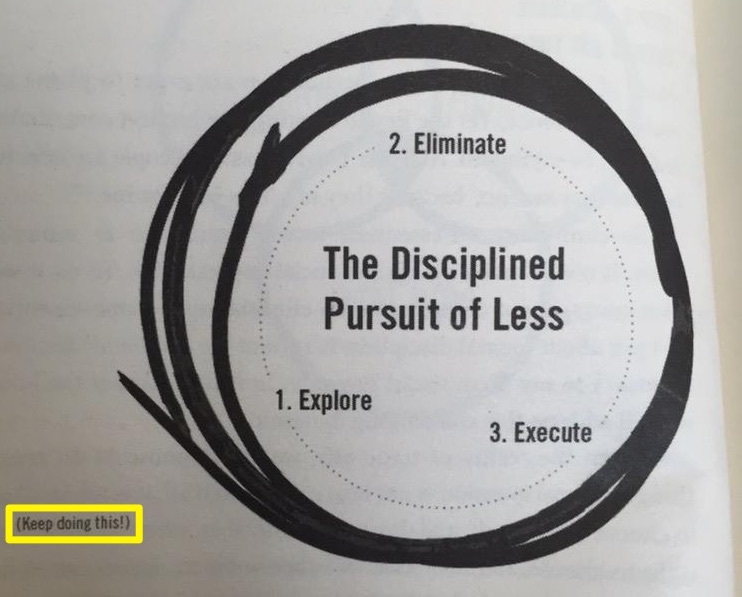 "Essentialism: The Disciplined Pursuit of Less" is a must-read. That's it! Honestly, it is quite an amazing list for one single book! Not to tell you again that this is a must-read. I'm wondering if the next books I purchased earlier this year will be of the same quality? What I'm sure, on the other hand, is that if I start to read a book and can't manage to get motivated by it after some chapters, I will simply drop it to focus only on the Essential ones that bring me something! What about you? Do you know of any must-read book that produced more than 5-10 dramatical effects on your life? I would be very glad if you would share them with us!